A genuinely new sound for a jazz trio -- swing plus hip-hop brings something powerfully new. In jazz, there is always much talk about the "new", but the music rarely feels new. After all, the obvious barriers to greater freedom were all broken down decades ago. And "new" fusions with other kinds of music long ago stopped seeming particularly new -- or particularly fruitful. If an artist is working in the venerable form of the acoustic piano trio, well -- "new" seems largely out of the question. Unless you are Robert Glasper. In My Element is the young pianist's second trio disc for Blue Note, and it is stunningly new. Working again with his acoustic trio -- Vicente Archer on bass and Damion Reid on drums -- Glasper succeeds in organically incorporating the rhythmic innovation of hip-hop into a jazz aesthetic. In his piano lines, and in the essential groove of the trio, Glasper has found a way to use the stuttering cadence of hip-hop to surprising, elegant effect. This innovation, achieved wholly without awkwardness and without trotting out the surface elements of hip-hop -- no rapping, no digital effects, no guest producing from Kanye West -- makes In My Element one of the key releases of 2007. What does this new groove sound like? On the opener, "G&B", the sound is light and swinging -- with Reid playing complexly on his ride cymbal and coming nowhere near a funk groove -- as befits a true jazz trio. Yet the music seems to be lurching and jerking with near-digital precision, pulling your ear out of its natural expectations of continuity, and doing this every second or so. But it's being done live in the studio, not with digital trickery. Huh? Though it seems that you can tap your foot to "G&B", the trio is in fact breaking up the measure into precisely irregular patterns, much the way a hip-hop producer "cuts" beats into hard-edged stutters with a computer. These units of the beat seem to be eighth or 16th notes, and the trio plays the whole tune -- including the improvised solos -- across this precise, jerking groove. The whole trio makes it sound so natural, however, that the track never seems less grooving and easy than a Bill Evans tune. Glasper's right hand moves across the chords with fleet ease even as his left hand cuts in perfect syncopation with his band mates. When the track ends suddenly -- with the precision of an editor's knife -- you think your ears are playing tricks on you. This effect recurs on a more traditional tune, Sam River's "Beatrice". While Glasper assays the melody with relaxed care, the trio arrangement beneath him again plays with your ears. The tune sounds like a waltz at first. Again, the beat is not irregular in the usual jazz or classical sense -- with a count of 5/4 or maybe irregular measures of two or three breaking up the standard count -- but it is chopped into finer stutters that the trio plays together with elan. The sonic illusion is that of tiny leaps in time. But because the soloists play over these cuts with fluid ease, the result is the jazz equivalent of hearing Beyonce sing or Q-Tip rap over the digitally syncopated samples of a hip-hop tune. With only the skin and skill of the trio making this sound -- and on a classic Sam Rivers ballad no less -- the result is still purely jazz. New jazz. "Silly Rabbit" is a more traditionally "out" tune, with no set melody occurring until about the four-minute mark, preceded by Glasper improvising in two-hand unison over another stuttered groove, somewhat as if Oscar Peterson had spent a year listening to nothing but Mos Def and Don Pullen. But then, with two minutes remaining, there is a long pause before we hear Glasper's daughter leave him a phone message in which she hums him a little tune she wrote. The trio begins playing beneath her, of course, and they float the oddly atonal line over the same skittering groove. The combination of the opening portion and the new melody is the kind of interesting juxtaposition that, again, makes this a trio record that delivers an authentic new perspective. Two other tracks are modern "mash-ups" that make you hear jazz in a new way. "J Dillalude" begins with another answering machine message, this time from rapper Q-Tip himself, suggesting that Glasper play some tunes by J Dilla (hip-hop producer/performer James Yancey) "trio style". The result is a series of edited-together snatches of neo-soul grooves that boast the way in which this new style -- syncopatedly snapping but also smooth in the extreme -- can make the Glasper trio sound almost like Ramsey Lewis or Ahmad Jamal. "Maiden Voyage/Everything In Its Right Place" is a reasonably ingenious combination of the Herbie Hancock anthem and the track from Radiohead's Kid A. Glasper mostly uses the Radiohead harmonies to change the way we hear the jazz standard, then he weaves motifs from the melody of "Maiden Voyage" through his improvisation over the Radiohead chords. It is lovely as well as new. Somewhat puzzling, on first listen, is another hip-hop affectation. Several of the tunes appear to end, then they return a moment later as interlude-like vamps that cleanse the palate. In some cases, this technique works against the music. For example, Glasper's exceptional gospel theme, "Y'outta Praise Him" seems about perfect as is -- beginning with a controlled solo piano introduction and turning into an exuberant trio performance -- and, when an exciting vamp section of improvisation fades up (and later fades back down) after the song seems to be over, the sense of formal completion is compromised. Why? "Tribute" is reminiscent of some of Jason Moran's recent work with tapes and voices. 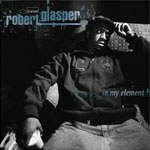 It is a lovely ballad theme that naturally incorporates portions of a eulogy for a member of Glasper's family. The vocal excerpts are rousing, and the trio performance allows them to rise up and seize your ears. It seems a bit perverse, again, when the track (and the album) fades out on this note. This is most certainly not a recording that is afraid to be blunt, clear, and new. In My Element is a decisive statement in many ways, so it seems to deserve a more definitive conclusion. Putting that one quibble aside, it is hard to imagine a more vigorous, ingenious, and exciting album of acoustic jazz in 2007, particularly on a major label. Robert Glasper has found a new way to bring jazz forward, and it is a path that incorporates up-to-the-minute fusion with traditional instruments and forms. This is a record that presents an honest-to-God working band playing with astonishing unity and purpose, yet the common vocabulary it exploits includes an ingredient that has never before been authentically incorporated into jazz. The record is a masterful achievement and, with it, Robert Glasper jumps to the front of the pack as a pianist not just of promise, but of singular vision.